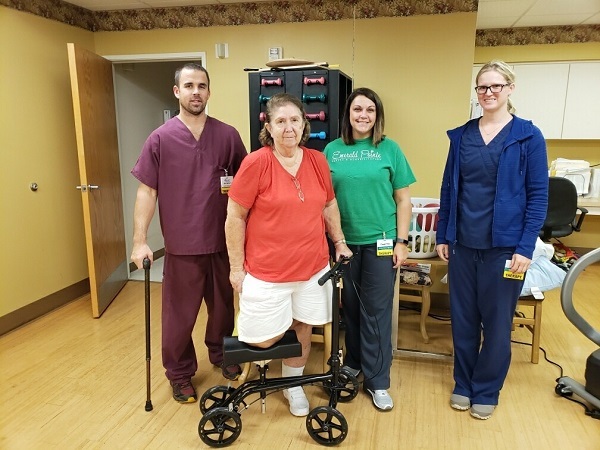 Emerald Pointe, a 64-bed skilled nursing facility in Barnesville, Ohio, and a proud part of the Foundations Health portfolio, has had another success story! The Emerald Pointe team was so happy to get Mellot back on her feet! Foundations Health is proud to support 55 skilled nursing facilities in Ohio. Founded by nursing home developer, Brian Colleran, Foundations Health is Ohio's premiere skilled nursing and long-term care organization with over 8000 employees serving thousands of residents throughout Ohio. Foundations Health is committed to the vision of Brian Colleran, to exceed expectations both in clinical outcomes and resident satisfaction and to strive to help each resident reach their maximum potential. This story is one of many examples that happen each day of this vision coming to fruition.